Two weeks ago President Trump and the Democratic leadership agreed to end the federal government shutdown. The continuing resolution calls for three weeks of funding while negotiations for a long term answer will take place. The status of Speaker Pelosi’s European/middle east trip was not mentioned. This shutdown set longevity records as the opposing sides dug in. And while some economic reports were delayed which could be a problem in gauging economic progress, Wall Street seemed unconcerned about the government employees who were out of work. On the other hand, it was very concerned with some Washington workers who remained at their desk. To the dismay of some, Federal Reserve chairman Jerome Powell (technically not a government employee) punched the time clock each day. And while he had no direct involvement in the government’s closure, Mr. Powell has recently received investors’ wrath. Stock market bulls are blaming the Fed’s less accommodating posture for the financial markets’ 4th quarter mayhem. To be sure, monetary policy changed in 2018 – interest rates were going up, not down, and the Fed was no longer buying bonds (monetizing debt). This certainly left its mark and played a role. But there are more issues beyond Fed policy that have contributed to the financial markets’ chaos. Before discussing the why, let’s review the what. As measured from the highs in September to the lows in late December, the major indexes tumbled approximately 20%. December was worst ‘December’ for the Dow Jones Industrial Average and S&P 500 since 1931 and it was the worst monthly drop since February 2009. For the Dow and S&P 500 it was the worst quarter since 2011 and for the Nasdaq it was the worst since 2009. With the New Year came a new direction. The S&P 500 rebounded 7.9% last month which made it the best ‘January’ since 1987 and the best of any month in over 3 years. Given the severity of the selloff, a bounce was not a surprise. The bears view it as a “dead-cat” variety while the bulls think the lows are in and this is the start of a longer lasting move. Returning to the Federal Reserve, they raised the short term interest rate in December which was the 9th time since December 2015. It’s easy to forget that when this string of increases began the overnight interest rate was at 0%. Further, it is also easy to forget that the rate had been at 0% for 7 years! This series of rate increases is the Fed’s attempt to normalize monetary policy 10 years after the financial crisis. The debate concerning the overnight lending rate’s appropriate level has been a hot topic within the financial markets for the past several years. However, this discussion intensified in the second half of 2018 especially as forecasts for 2019 added 2 to 4 more increases combined with signs of global economic weakness. Investors feared that the Fed was determined to raise interest rates and reduce their balance sheet which could accelerate any economic slowdown. Certainly this could have contributed to the markets’ 4th quarter upheaval. But there are some other problems. China has been coughing some hairballs in form of some very soft data. Also, two large peer to peer leading organizations failed. These are companies that gather investor capital and then lend and invest it – similar to a bank but without branches. There are estimates that this Chinese lending sector has over $200 trillion of loans. It’s hard to know the fallout of these failures but it could be material. No man is an island. Likewise, no country is isolated in today’s international financial system. So naturally, China’s slowdown has an influence beyond its borders and perhaps the biggest impact is felt in Germany. China is one of Germany’s largest export markets and has contributed to declining activity in Europe. Germany is the largest economy in the EU and the 4th largest in the world. Closer to home, there are other market worries besides the Federal Reserve. The federal government shutdown obviously causes uncertainty and disruptions. It also made an already chilly political environment colder which doesn’t help consumer and business confidence. 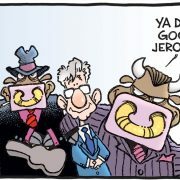 This all may turn out to be much ado about nothing as the Fed has quickly had a change of heart on playing the villain. Fed Chairman Jerome Powell has retreated on future interest rate cuts and balance sheet reductions. He recently used word like “patient” and “flexibility” referring to future policy decisions. This is a change from the projected interest rates hikes for 2019. 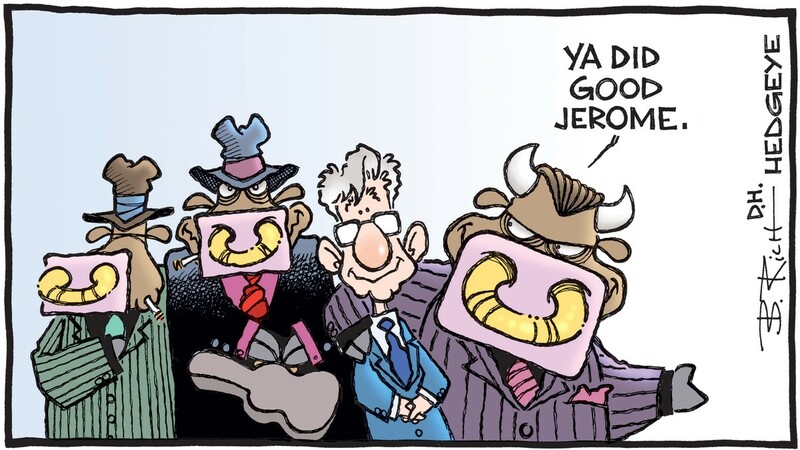 The news has greatly emboldened the bulls as they believe that the Fed has their back once again and won’t let the stock market get too sloppy. Importantly, this latest flip from tightening to neutral (and possible loosening) contradicts the economic data. We have record low unemployment, corporate profits are very strong, and the highest GDP growth in many years. This illogical shift of position is both significant and puzzling. The answer is related to the unstable stock market. The Fed will not admit that they are using the stock market as an indicator for policy. This is despite claims by skeptics that the central bank intensely watches (and supports through strategic intervention) the stock market. A quick look at a collection of statements from Jerome Powell provide some insight. On October 3rd, Chairman Powell referred to the Fed’s stance as “a long way from neutral”. In others words, expect more interest rate increases as the economy was strong. In November he said the rate, which was around the same level at the time of his October statement, was “just below” the appropriate level. How did we go from “a long way” to “just below” neutral? The stock market fell 10% in between those comments. In December the Mr. Powell offered some more stern comments about the reducing the Fed’s balance sheet (tightening) only to reverse course on January 4th. It was at the January presentation that he used more conciliatory words. Since then stocks have spiked higher giving us the best January in over 30 years. Tying monetary policy to stock prices sounds innocent. However, if investors are confident that the Fed will prevent any serious decline, prices can easily climb to extreme levels and risk becoming a bubble. Further if interest rates are too low relative to economic strength, there will be misallocations of capital. This is what helped inflate the housing bubble last decade as the Fed kept interest rates too low for too long. As you may remember, this was the solution used to fix for the Dot Com stock market bubble. The Federal Reserve is trying calm the financial markets after the recent turmoil. It’s soothing language and signals worked in January. However, the unintended consequence could turn out to be enhanced systemic risk as assets are mispriced. And overvalued financial markets in an overleveraged global systems with slowing international economies could get much worse than 2018’s 4th quarter. https://kerrfinancial.com/wp-content/uploads/2019/02/dovefather.jpg 675 1200 jkerr http://kerrfinancial.com.c1.previewmysite.com/wp-content/uploads/2017/12/kerr-logo.jpg jkerr2019-03-05 02:31:202019-03-05 02:31:20"You'll Like This Guy. He's All Right. He's a Goodfella, One of Us."